We have, once again, hit peach season. Every year the song “movin’ to the country, gonna eat a lot of peaches” goes through my head. Our peach trees in the orchard are still too small to fruit, but we have been given a box by some friends, and have gone foraging along the side of the roads for more. The kids hoover them down, and I cook up a big batch to whack in the freezer for in pies and crumbles over the winter. There is nothing that makes you more smugly satisfied than eating a peach crumble in July made with fruit you picked the previous summer. 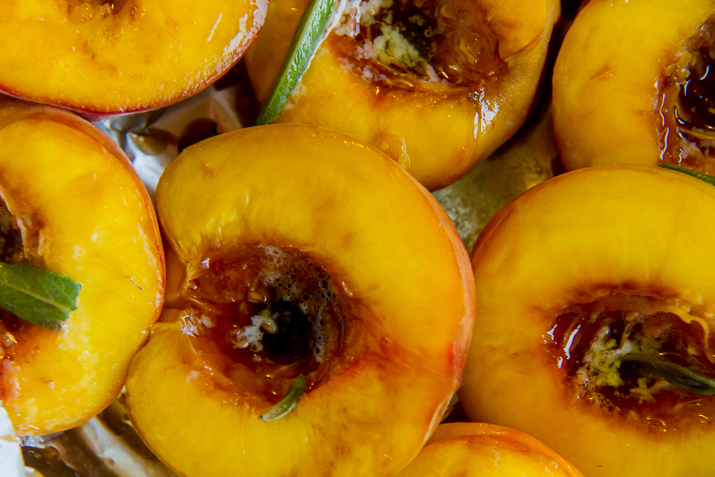 Of course there are still more peaches to be used up so I decided to whack some in the oven to serve with the pork chops and some mash for dinner. Pork and peaches are best friends. They belong together. Though my kids ate the left over peaches on their own like dessert. 6 ripe peaches - slip stone peaches work best, but use cling stone if that's what you have got. Spread a large sheet of foil out on a baking tray. 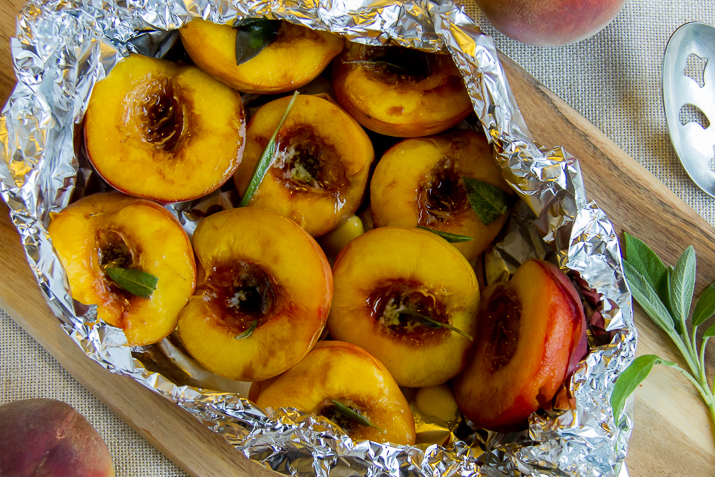 Halve the peaches, remove the stone, and place in the centre of the foil - cut side up. In the centre of each half place a small dot of butter, and a sage leaf (half will do if the leaf is large). Drizzle with the balsamic vinegar, and sprinkle with the sugar. Place another sheet of foil over the top. Turn the edges of the foil together to form a parcel. Place the tray in a preheated hot oven (200*c) for 20 minutes, or until the juices just begin to run. Serve with pork chops and mash, or on their own with a scoop of icecream. How do you like your peaches? I sing that song in my head too, now that our peaches are ripening! Lots of preserving coming up, but these look like a great idea too. I am in Hamilton (not quite as cold as Ballarat!) but have had no luck with passionfruit. I have a space against a tin shed now – wonder if that would be warm enough? We are in Ballarat (aka the coldest place in the nation!) and my mother in law manages to grown passionfruit. She has the plant growing up against the brick house, which protects it a bit. Nine years and still going strong! Mum and dad both came originally from Lithgow. After a spell in Sydney they retired to Lawson. Dad grew the most amazing passionfruit and had an enormous banana passionfruit vine over the dogs' shelter for his afghans. My sons loved summer holidays. They ate passionfruit all day. I would love passionfruit – we grew them in the mountains. Unfortunately it is too cold here for them to grow. I often pick up a bag of them when I see them on special! How do I like my peaches? Pretty well anyway. I used to freeze mine raw with a tiny amount of ascorbic acid power, Vitamin C, stirred through to stop browning . Add freshly frozen passionfruit from summer and there is a nostalgic winter dessert. We rarely have dessert these days but with three boys who were always hungry, dessert was part of dinner. Has CB thought of a few passionfruit vines? Need replanting every three years as they get a virus, but very good. Plant some each year.